Why buy a Playstation? It is after all the best gaming system in terms of value. With 300 games to chose from then the Nintendo 64 with only 30 games, Playstation also offers cheaper games($20-$60) then $60-$79 games from Nintendo 64. So if you buy a Nintendo 64 Game you can actually buy 2 or 3 new playstation games. Below are some caharacteristics of the playstation console. Below is an article on the Playstation. (1)		What is this FAQ for? 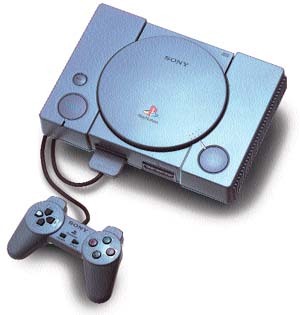 (2)		What is the Sony PlayStation (aka Sony PSX)? (3)		What is the history of the Sony PlayStation? (4)		Who is supporting the Sony PlayStation? (5)		Where/when will it be available? And for how much!? (6)		What do you get for your money? (7)		What are the differences between the US and European releases? (10)		Which machines can/will be compared to the PlayStation? (11)		Which PlayStation should I buy? (12)		What is the arcade connection? (1)     What is this FAQ for? important releases by the major players Namco, Konami, Taito etc. (2)     What is the Sony PlayStation!? weekend of being on sale. hardware tri-axial rotation, and gourard shading, among others. PlayStation has two ports for two memory cards. via the Combat cable. See  for more developments. (3)     What is the history behind the PlayStation!? (4)     Who is supporting the Sony PlayStation!? Sony have created three new divisions to cover the three main markets. (SCEA), and Sony Computer Entertainment Europe (SCEE). Arts, Crystal Dynamics, Time Warner Interactive, Williams, Interplay, Virgin. See 'Rumours' for other  developers. (5)     Where/when will it be available? And for how much!? PS III in 2003. So relax and get on with it. (6)     What do you get for your money? Ridge Racer, which will save you $10, the bundle costing $349 dollars. Extreme (1 track rollerblade); Jumping Flash (1 level); and Wipeout (1 level). plain-text menu overlaid on a gyrating rainbow background. and change the flat pieces to shaded ball sprites. creatures and changes the viewing angle of the scene. Begins with a Gouraud-shaded box, cone and sphere appearing on screen. shapes while spinning them and adjusting the viewing distance. cross buttons change the various light sources intensities. Thumb Pad Down: makes all 3 objects goraud shaded? things. You cannot control this demonstration except to stop it. the globe and increase the number of globes from one to three. to bare his teeth, and cause him to roar and open his mouth. Hold L1 and R1 and press Select: Dino stops and just stand. mode! is this balloon mode?). (7)	What are the differences between the US and European releases? *	The PS comes with an RF lead (and rumoured RGB SCART lead). audio CD graphics package. (Which I presume is audio reactive). release a mass market product that couldn't be used a regular tv. would you want to cripple the picture you get from it? *	Composite audio video cable. chrominance and luminance signal and the usual two stereo audio outputs. 'guns'. (Red, Green and Blue). (9)     Will the American, Japanese, and European PlayStation be compatible!? this, (one involving a bullet!). Pop open the door to the CD - make sure there is no disc in the unit. get something small- yet has a bit of weight to put on the sensor. rather than a standard S-Video cable which would be much cheaper. S-Video, SCART (RGB) or RF (Arrgggh!). (10)	Which machines can/will be compared to the PlayStation? Please keep your opinions to yourself on this thorny topic, the newsgroups rec. titles on the Gameboy that are still better than many 32 bits titles!! (11)     Which PlayStation should I buy? to the shop and play merry hell with the staff. 'nature' intended, full screen and full speed. system is NTSC and your voltage is 100 Volts. Life is sweet. plug in and go. Life is sweet. The Hut (Uncanny!). Life is sweet as a lemon. on PAL, when it could be making the thing run faster on NTSC! few things that you need. A tv or monitor that supports a 60Hz refresh rate. transformer that will take 220-240V @50Hz supply and change it to 110V @60Hz. (12)     What is the Arcade Connection? get a quick translation to the PlayStation. near Tokyo, before a PlayStation release possibly as early as late December. company will handle the arcade release. The CPU also contains the GTE, the MDEC and the DMA controller. The GTE performs high speed matrix multiplies. high-quality video playback and also decompress graphics into VRAM. Handles everything that is drawn on screen. *    Rendered in hardware - Upto 360K polygon/sec. -  Red Right and White Left RCA phono plugs for connection to a hifi. a Next Generation console, if you are going to play it on an RF TV! Incl. RFU Adapter, Antenna Adjuster Integrator and Antenna Converter. Western hands the Japanese controller was too small. Each memory card holds 128KB and divided into 15 blocks. listing below shows you the number of blocks needed for each title. and you have the potential of 16 players at once!!! This is a chunky piece of kit, a solid based joystick with six buttons. unlimited lives and continues etc. Deluxe; Crime Crackers; Ridge Racer etc. cart up. However see  for more developments on this front. this as I have no idea if it will work. Scaredy cats can buy one from Sony. Note: SCART pins 17 and 18 are bridged together. SCART pins 8 and 16 are connected to a () resistor. Note:	Items marked with * are available on day of release. L represents Mulitplayer Linkup via the Combat cable. M represents Multiplayer via the Multitap unit. different countries all the time. *	Die Hard Gamefan		? FREEPOST BS4900			gamers with big wallets. Suite 222                       material between the two publications. 1920 Highland Avenue            available is almost everywhere. 951 Mariner's Island Blvd. some PlayStation coverage.
? but with some article/news sharing. *	P.S.X. From the Sendai (EGM) stable of mags. *	Ultimate Future Games		Next Generation only magazine. 9171 Wilshire Blvd.,		gaming magazine. good oldies coming our way! Comments and/or criticisms are also welcomed! rest at home on my old Amiga A1200. Story Translations of games are available here.